Great nose: smells spicy and red. Doesn’t really taste like any other malbec I’ve ever had. In fact, it reminds me more of a Languedoc wine–something like l’Esprit du Silene with its blend of syrah, grenache, and cinsault–because it seems rustic and earthy. I can taste the garrigue in this wine, with leather and spice and a slight taste of persimmon. Granted, there ARE malbec characteristics of cherry and berries–it seemed a bit rounder and softer than anything from the Languedoc, too. Overall, a great choice and a steal for $5.95. I will update this post after pairing the wine with tonight’s dinner: marinated kalbi, or Korean barbeque. Who is the importer for Sedna and any other wines from Flavio Senetiner? Hey Sean–unfortunately, I don’t happen to have the importer off hand. But, if you contact Chronicle Wine Cellar (www.cwcellar.com) I’m sure they’ll have that information. Thanks for the comment. 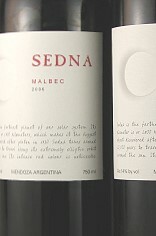 The Sedna Malbec is a fantastic value and a great introduction to drinking wine copiously. =) I would drink this with a bit of a chill on it–it’s lighter, especially compared to most other Malbecs, so it’s good as a summer wine. It would go well with barbecue, hamburgers, or pork tenderloin.